Still wondering how versatile an Immersion Blender is? You can make use of this product in just about any type of restaurant or food establishment. Bakery- Blend vanilla cupcake frosting with a strawberry compote. Bar- Daiquiris and Margaritas…. need we say more! 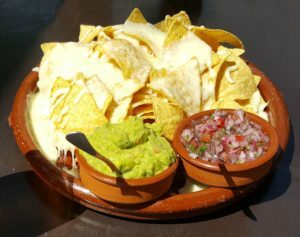 Mexican Restaurant- Easily puree refried beans for a delicious Bean Dip or to serve alongside burritos. Asian Restaurant- Create Hot and Sour Thai Soup without making a mess. American Restaurant- Create a unique Cream of Broccoli soup for cold days and Gazpacho for the hot summer weather! Bagel Shop- Blend together cream cheese and herbs to take your Bagels and Cream Cheese to the next level. Ice Cream Shop- Blend up classic favorites like Milkshakes and Smoothies. Italian Restaurant- Perfect for mixing and chopping tomatoes for Spaghetti Marinara of course. Pizzeria- Make sure your herbs and pizza sauce are thoroughly blended with an Immersion Blender. Middle Eastern Restaurant- You can make hummus and baba ghanouj in a flash with an Immersion Blender. Don’t forget to leave a review on Immersion Blenders by April 30! You’ll receive 200 Burkett Bucks good on any future purchase at Burkett’s as well as be placed in a drawing to win a FREE Waring WSB33 Immersion Blender! When leaving a review on ANY Immersion Blender make sure to sign in and leave your email so that we can contact you! Summer is right around the corner and your customers are salivating for a tasty beverage to cool down. Treat them to a delicious Mixed Berry Margarita made with this month’s Product Palooza product- an Immersion Blender. Serve in a classic 16-ounce Margarita Glass! Water and electrical cooking equipment do not mix! Never tip your Immersion Blender upside down when washing and drying. Doing so will allow water to run down the shaft and destroy your motor. Last week to leave a product review on Immersion Blenders for your chance to win a Waring WSB33 Immersion Blender and everyone will also receive 200 Burkett Bucks Reward Points good on future purchases. Just follow this link —> Product Palooza! I Want an Immersion Blender! Avocados have seen a resurgence in recent years, including having their own national holiday. Whip up large batches of guacamole, salsa or refried beans to tantalize your customers’ taste buds anytime with the help of the incredibly versatile immersion blender. Insert Waring WSB33X Immersion Blender into a mixing bowl. Add garlic, onion, and jalapeño to bowl and pulse 10-12 times. Add avocado, lime, cumin, and salt. Pulse 10 times to chop avocados. Then blend continuously in 20-30 second intervals until desired consistency is reached. Serve topped with tomatoes, red onions, Queso Fresco and a side of tortillas. Robot Coupe MP 800 Turbo Immersion Blender- The Ultimate Immersion Blending Machine! Are you looking for the most powerful Immersion Blender on the market? A machine that will mix, blend and puree any concoction you place before it? The Robot Coupe MP 800 Turbo Immersion Blender, with a 29″ shaft, is capable of handling capacities up to 100 gallons and features a single speed of 12,000rpm. A removable stainless steel shaft allows for simple cleaning, storage and maintenance. Need more convincing? Its EBS (Electronic Boost System) technology produces 20% more power compared to a conventional motor. If you are looking for the ultimate Immersion Blender then the Robot Coupe MP 800 Turbo is the one you need. If you have any questions please contact one of our knowledgable Sales Consultants at 1-800-828-8564. Leave a product review on Immersion Blenders for your chance to win a Waring WSB33 Immersion Blender and everyone will also receive 200 Burkett Bucks Reward Points good on future purchases. Just follow this link —> Product Palooza! I Want an Immersion Blender! The Robot Coupe MP 600 Turbo Immersion Blender can be used for a variety of recipes- no matter how much you are making! Bust out that Immersion Blender to make a delicious spread that you and your customers will love! Quick, easy, and can be made ahead of time, this recipe will definitely be a crowd pleaser! Crackers, Cucumbers and Crostini for dipping. With an Immersion Blender, mince garlic for 10-15 seconds. Add remaining ingredients (except crackers, cucumbers, and crostini) and pulse evenly 10-15 times or until you reach the desired consistency. Every product in your kitchen has a different use, regardless of how similar their actions are. You have a knife that cuts pieces of Filet Mignon, while a different knife is used for slicing and dicing vegetables. Blenders are no different. Some a free standing and blend smoothies, others are perfect for mincing vegetables, while some blenders allow you to mix food and drinks in any pot or mixing bowl. Immersion Blender… One of the easiest and most versatile blenders on the market, an Immersion Blender is a necessity in any commercial kitchen. While other blenders require that you use a specific mixing vessel, you can use any type of bowl, pot, or container with an Immersion Blender. However, one drawback to the Immersion Blender is you have to hold it as you are blending. Bar Blender…Simply pour your ingredients into the blender carafe and press a button to thoroughly mix, blend or puree your mixture. A Bar Blender is perfect for mixing liquids such as milkshakes and smoothies. Added benefits include, they are a hands-free appliance, offer a high and low power setting, and many also have a pulse feature for crushing ice. A Bar Blender however, will not properly chop food. Food Blenders… Food mixers usually have more features, options and speeds so you can process foods of all sorts of consistencies and varying degrees of frozenness. Food blenders can be used to prepare salsas, combine ingredients for various foods like cakes and specialty sauces. A drawback is you have to use the blenders carafe, which means having to pour a soup mixture for example into the blender carafe and then returning it to the pot- adding an extra step in your cooking process. Immersion Blenders and Food and Bar Blenders offer great benefits but each has a drawback that is available in the alternative. In the end, you need to consider the use of your Blender, before making a purchase. If you will be making a lot of mixed drinks, smoothies, and milkshakes, a Bar Blender will better suite your needs. On the other hand, if you plan to use a blender for soups, salsas, marinara sauces an Immersion Blender or Food Blender is the better option.